Industry: Oil / Gas / Petrochemical / Refineries / Metal / Heavy Engineering & General Work. >> Minimum 5 years of experience in maintenance and troubleshooting of Mechanical, Hydraulics and Pneumatics equipment. >> Knowledge about Installation of Mechanical, Hydraulic and Pneumatics equipment. >> Computer literate to write reports. Experience requirements: Minimum 5 years of experience in maintenance and troubleshooting of Mechanical, Hydraulics and Pneumatics equipment. Desired Skills: Knowledge about Installation of Mechanical, Hydraulic and Pneumatics equipment. 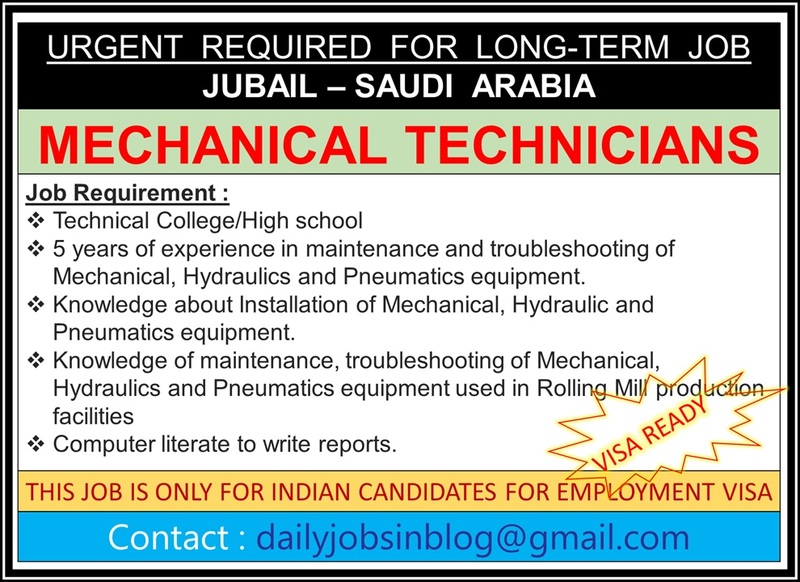 How to Apply: Please send your CV to dailyjobsinblog@gmail.com with clearly mentioned "Mechanical Technician CV"